Until about twenty years ago, wedding music was limited to church hymns and other religious music. Now, couples are choosing secular music for their wedding ceremonies that fits their personalities and vibes. If the bride and groom are religious, or if your ceremony location requires it, religious music is perfectly appropriate. Otherwise, consider adding a bit of contemporary flair to your musical selections. Most guests tend to arrive 20 to 30 minutes before the ceremony begins so that they can get good seats. Don't just leave them sitting in silence, but entertain them with some witty and fun selections about love and marriage. Don’t Falter at the Altar Cab Calloway sings a funny song about giving a nervous groom strength. The Chapel of Love A classic song by the Dixie Cups, but also recorded by several others, including the "Divine Miss M"―Bette Midler. Depending on the size of your wedding party, and the order of your processional, you'll probably want two or three songs. This is setting the stage for the ceremony and important ritual that's about to take place, so they should have some pomp and circumstance to them. La Valse d'Amelie from the Amelie movie soundtrack. Heavenly Day by Patty Griffin. The simplicity and beauty of Griffith singing the words "heavenly day" seem to exactly evoke the mood of a wedding ceremony. Seems I'm Never Tired of Lovin' You by Nina Simone. You know the look on a groom's face when he sees his beloved walking towards him? This song seems to fit the public but intimate moment of the bride's entrance. The Luckiest Ben Folds Five. I've heard seen many people start to cry when they hear this song because it reminds them perfectly of the way they feel about their sweetheart. There She Goes by the La's. A cute fun song for the bride's entrance. 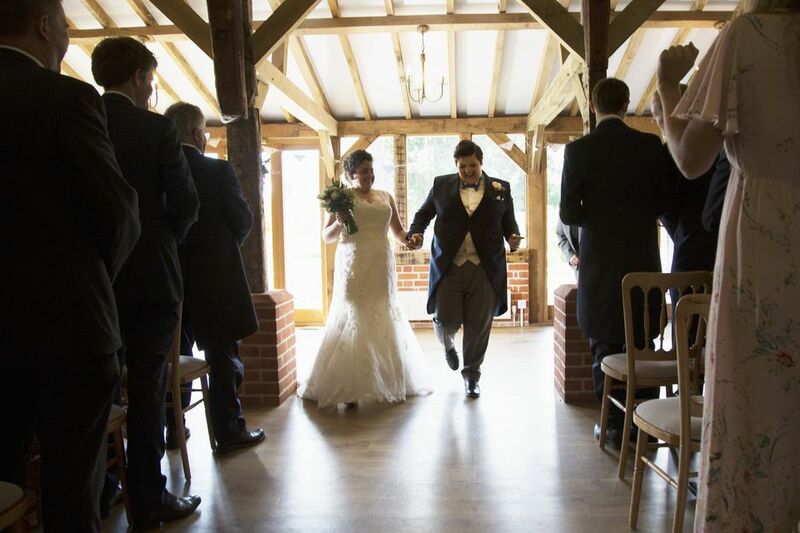 Once you've chosen your wedding ceremony site, time yourself walk down the length of the aisle. Make sure you've chosen a song that makes sense to fade out at approximately that spot, as you won't want to be awkwardly stuck waiting for the song to finish before you can begin with the ceremony. If you've got friends who play music or are hiring professional musicians for your ceremony, you might want to have them perform during the ceremony. This is particularly appropriate if you are having a unity candle ceremony, or are signing the registry. Ashokan Farewell This beautiful instrumental song is gorgeous for strings and/or piano. At Last by Ella Fitzgerald. The great Ella has many love songs appropriate for wedding ceremony music, but this seems to be the most popular. Many also choose this song for processional music. Time After Time No, not the Cyndi Lauper song, but the one made famous by Chet Baker. As the wedding party walks back down the altar, choose something celebratory and upbeat that will help your guests get in the mood for dancing at the reception.